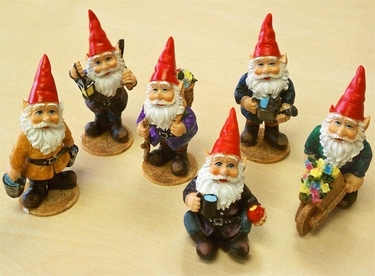 These extra hard working miniature garden gnomes are doing everything possible to keep your garden in top notch shape! This new gnome set is awesome, and we're thrilled to release some of the most detailed and colorful miniature gnomes we've ever sold! A perfect size for your planters, window sills, purses (for random pictures), around your office computer, and anywhere else you need just a touch of friendly garden whimsy. Include a gnome holding a watering can, a gnome holding two buckets of water, a gnome with lantern and pickax, a gnome pushing a small cart of flowers, another gnome with walking stick and bushel of flowers, and one super cute gnome taking a break for a drink and and apple. Check out the bite taken in the apple!